Good health is essential for any successful workforce and business. However, with three quarters of women and two thirds of men today suffering with some level of stress1, how well do employers safeguard the wellbeing of their employees? 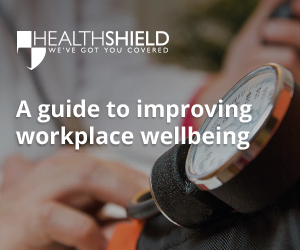 In this guide, Health Shield provides direction on how health screening can help to improve workplace wellbeing. Health Shield’s Workplace Health Screening is a programme designed to assess the health of an employer’s workforce. It looks at an employee’s current picture of health and helps to identify potential health risks, and then provides health advice, support and steps for improvement for those that need it. Health Shield offers a range of screening programmes to fit any type and size of business, as well as any budget. Plus, as screening takes between just 10 and 90 minutes, and can be done from a business’s own place of work, it’s a quick and convenient solution. As well as individual reports for each employee, business’ can also get a comprehensive company-level graph-based report* that can be used to help shape their wellbeing strategy, be used as a catalyst to introduce new company-wide initiatives and ultimately improve the overall health of a company’s workforce. *Report available on a minimum of 25 employees having health assessments due to data protection and employees' right to remain anonymous.